This is a fun story about a bratty little sister who does not like books or going to the library. Her (mostly) patient big brother tries to find ways to entertain her while still trying to do his work. But it is the magic of storytime that finally gets Beatrice's attention. I love that it shows that even reluctant readers enjoy being read to and that once hooked, a child can learn to love books. I know that from my own experience, our girls love to be read to and that even when they are resisting independent reading, they are eager for me to read to or with them. We discussed the collaboration between Laura Joffe Numeroff and Lynn Munsinger and how they are more famously paired with other authors/illustrators. Our girls said that they could see the same style of illustration that they love from the Tacky series and they loved the anthropomorphic use of the dogs. The plot was very predictable, but still entertaining and we enjoyed reading it together. This book was a good book. At first, when I looked at the title, I thought this book was going to be about a child who didn't want to do chores or who didn't want to do what her parents told her to do. But, this book was actually about how she didn't like to...READ!! How horrible? But I could relate to this book. Also, I was thinking about the students who would be in our classroom who might have english difficulties and can't read and they get frustrated. If they get frustrated, then they need help cultivating that like or love for reading. It just takes one tiny teacher to make a huge improvement on a child's life. Beatrice is like many students. Books are not interesting to her. Not only is this a good book for students to read, it teaches a wonderful lesson to educators. It was not until Beatrice was connected to a book that she realized reading could be fun. This book is a reminder at the importance of connections to students. It also shows students that there are times when we don't want to do something, but we change our mind. This book also shows the powerful ability a book has to capture one's heart. The adamant Beatrice who didn't want to read, changed her mind and couldn't be pulled away. All because she connected to the story. The thing I loved about this book was the way the illustrations did such a great job of getting to the truth of this story, and of who the character of Beatrice is. I saw my sons, and the relationship that they have with each other, in these illustrations. My kids loved the twist at the end. Either way, it was a great read. So cute! What can I say? Hmm, my four year old loves it and boy can she be a "Beatrice." The story and illustrations in this book was so super cute my adult special needs son and I both enjoyed it. The main characters is a brother and sister (who are drawn as puppies) the Big brother has to go to the library to do a school project and he has to watch his little sister. She does not want to go to the library and let's him know about it. He tries and tries to find something she would like about the library until one day he leaves her in a room with other kids and a librarian where she suddenly starts listening to 'story time' and then she 'doesn't want' to leave when it comes time to leave. Very charming book to get children introduced to what libraries have to offer them. 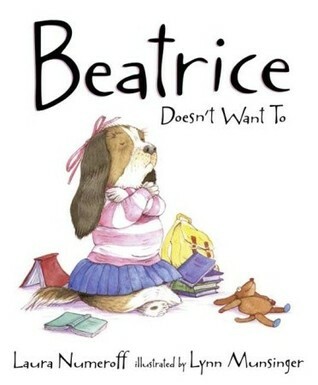 Title:Beatrice Doesn’t Want To italicizeAuthor: Laura Numeroff Illustrator: Lynn Munsinger Genre: Picture Book Theme(s): Reluctant Readers, Good-Fit Books, InterestsOpening line/sentence: Beatrice didn’t like books. Brief Book Summary: Beatrice does not like reading, books, or libraries, but everyday for three days in a row, she is forced to go to the library with her brother. Each day, she would sit and watch her brother being very bored, until finally her brother had an idea. He took her to a read aloud room where other small kids were. At first Beatrice didn’t want to be there either, but when the Librarian started reading books about roller-skating; it caught her interest! She then paid attention to the rest of the book and even asked to see the book after. She sat in a chair and read the book over and over and looked at all the pictures. When her brother came up to her when it was time to leave, she didn’t want to do that either. Professional Recommendation/Review #1: Children's LiteratureShe is pictured as a dressed-up, long-eared puppy. Beatrice, however, is obviously just like many youngsters. Unfortunately she does not like books, reading, or even going to the library. Yet her older brother Henry has to take her there with him for three afternoons when he does his research for a report and must take care of her. Beatrice does not want to do anything Henry suggests. She just watches and pesters him. She also does not want to return to the library the next day, and really annoys him. By the third day, Henry decides she must go to Story Hour whether she "wants to" or not. Fortunately the librarian manages to capture her attention, and a new convert to the pleasure of books is made. Munsinger exploits the potentials of pencil, ink line drawings, and watercolors to illuminate the range of youthful body and facial gestures to broadcast emotions. Both of her anthropomorphic canines are masters at communicating those attitudes which we see in youngsters from time to time. There is just enough context to set the stages without getting in the way of the action. And the type is large and easy to read. We can only hope that we will have many successes like Beatrice out there in our libraries. 2004 (orig. 1981), Candlewick Press, Ages 3 to 6. —Ken Marantz and Sylvia MarantzProfessional Recommendation/Review #2: School Library JournalPreS-K-Beatrice doesn't like books. The last place she wants to be is in the library, but her older brother has to complete a report on dinosaurs and she is in his care. Done in watercolor, ink, and pencil and featuring floppy-eared canine characters, the expressive illustrations perfectly capture the humor of the text. Beatrice's facial expressions are priceless as she repeatedly attempts to distract her brother from his work: she clings to him with adoring and overly exaggerated interest; she taps him on the shoulder and proclaims, "I'm bored"; and she holds his tail as she trails his every move. Finally reaching his limit, Henry drops Beatrice off in the storytime room. To her grudging amazement, her interest is piqued and she even laughs out loud when the librarian reads a story about a roller-skating mouse. When Henry is ready to go, he finds Beatrice sitting quietly in a big stuffed chair, totally absorbed in the book. This charming tale emphasizes the importance of finding the right book for the right reader.-Wanda Meyers-Hines, Ridgecrest Elementary School, Huntsville, AL Copyright 2004 Reed Business Information.Response to Two Professional Reviews: Both responses praise the illustrations of the book, as well as the large text throughout. This makes the book not only easy to read, but also easy to comprehend as well. In addition, the reviews claim that this is a very “charming tale”, that teaches the lesson about finding the right book for YOU. They both acknowledge that Beatrice’s problem with books and reading is something somewhat common among children, and that it can be solved with solutions like the one in the library. Evaluation of Literary Elements: I think this book’s large print and expression-filled illustrations create a story that is easily accessible for early readers, or for read-aloud. I think that the repetition of the line “I don’t want to”, not only allows the young children to be able to predict what Beatrice will say, but also can relate to them in their own lives. Kids often don’t want to be certain places or do certain tasks, and I think that this can easily relate that good can come out of the things we don’t wish to do. Lastly, I think that the characters add a lot to the book in the way that they are also relatable to children. Having that older sibling character in the story definitely reaches a great population and we can relate to tagging along and watching, even if we don’t want to. Consideration of Instructional Application: I would LOVE to use this in an instructional environment! I think that this would be a great book to start off the year with in the younger grades. This would be a good read aloud to talk about finding “good-fit” books for every child, and really finding topics that they are interested in. After reading the book, it would be so neat to talk as a group about topics that interest them and what it means to be a “good-fit” book. Overall, I think this could be such a useful tool in the classroom to show the children that it is okay to dislike reading—but you can find books that make you fall in love with it! 1. no awards2. k-2 grade3. Beatrice does not like reading, but her brother had a paper to write so she has to go to the library with him. Just when he thinks he will never get his paper done he puts his little sister in to listen to the librarian read. After hearing the book read, she sits down to look through it herself and ends up enjoying it. 4. Some kids may feel the same way as her, especially if they are struggling with reading, so it is a cute way to show them they should try to get into reading. I liked the illustrations and the underlying lessons to be learned. 5. A. get students to try things they think they will not like B. Use in talk about beginning middle and end. Beatrice doesn't want to do anything she's asked to do - especially read a book. Her clever brother takes her to library story time and she's hooked. Fostering that initial love of reading. Sibling relationships.Might be fun to pair with Beatrice Gets Carried Away & compare the two Beatrices. Beatrice is forced to go to the library with her brother and hates every minute of it until she discovers storytime. Lots of dialogue and might be a cute little storytime read. What an awesome way to follow up on an introductory reading inventory to get to know students. I used this book as a study in characters---how do we know what characters feel. It's super obvious to adult readers, but a good example for first graders. Went along with our curriculum and it was really cute. Personal Reflection: This story of a persistent young dog that is personified is a cute book that many children can relate to. What was great about this book was it described the life-to-text connection that we want our students to have. Beatrice is able to relate the librarians story about roller skating to her experience roller in her house. This connection leads to Beatrice's new found love of reading. Purposes: -I think this would be a great read aloud to K-1st graders to get them excited and engaged in learning how to read. Kids can often be stubborn but when they start learning something that interests them they connect and get more out of the content. The simple vocabulary and inviting illustration make this a great book for younger kids.Curriculum: -introduction to learning about the life skill of being flex able. You can discuss how frustrated Beatrice's brother was when she would say "I don't want to. "-Talk about the use of repetition. Have students point out the repetition. "I don't want to" -Introduction to teaching about personification. The whole book is a personification because the author is giving animals human-like characteristics like talking and going to the library. Beatrice does not like to read. She does not want to even be near a library, but luckily her opinion may be able to change after getting the chance to listen to a good book. This book could be used when teaching students about making predictions before and during their reading. The students could predict what they think will happen in the story before beginning reading by using their clues, such as the title and cover picture, to make an educated guess. The students can predict again what they think will happen part of the way through the book and see how their first predictions may have proven to be wrong. These predictions can be done through the use of sticky notes or discussion based. Remind students that Good readers are constantly predicting what they think will happen next, so it is important to show students this through teaching. This book could also be used to show students that it is alright to change your opinion of something. Beatrice at first didn't want to go to the library or read a book, but by the end she changed her opinion of both. This could also be mentioned while reading of this book. Beatrice does not enjoy reading or anything to do with books. She is forced to go to the library with her brother Henry, while he works on a school project. Throughout Beatrice's journey in the library her catch phase is 'I don't want to.' Beatrice soon enters the children's area where she realizes that she truly loves books after all. When Henry is done at the library he realizes his sister doesn't want to leave, she even refuses to leave by saying 'I don't want to.' I believe this book would be great to read to Kindergarteners who aren't used to using the school library. It brings comedy through the authors word choice to show that even if we don't think we like books, we can find a fun way to make the library enjoyable. There was quite a bit of dialogue throughout the book that could get confusing to Kindergarteners but the lesson and meaning of the book is beneficial for this age. It's a reading level of a 2.2 so I would recommend it to 1st-3rd grade. This book has a great lesson about going to the library and learning to be curious about reading instead of automatically saying that you hate the library and books. This story is a short story about Beatrice and her brother Henry and their trips to the library. Henry had to go the library to do a book report and he had to take Beatrice with him because she couldn’t be home alone. In the beginning she would just complain and say “I don’t want to” but at the very end of the book Henry leaves her to hear a read aloud done by the librarian and Beatrice falls in love with the book and doesn’t want to leave the library. I plan on reading this book to my class someday and then having my students write me stories about their favorite or first time to the library and whether or not they liked it or not. This book is about a young girl who hates going to the library with her older brother Henry. Three days of the week, Henry has to drag Beatrice along to the library while he works on a report for school. Each day, Beatrice bothers Henry because she is bored needs a drink of water. One day, while at the library Henry discovered that the librarian was reading a story to the children. He didn't hesitate to take Beatrice to the story room despite her protests. He told her he would be back as soon as he got his work down. Beatrice was upset so she tried to ignore the librarian while she read. The librarian read a story that Beatrice decided she was interested in. By the end of the reading, Beatrice wanted to look at the books herself. When Henry came back to get her so they could go home, Beatrice said, "she didn't want to!" Beatrice does not like books, nor does she like going to the library. Unfortunately, she has to tag along with big brother, Henry, as he works on his book report. She certainly thinks she hates the library, but one of those times she hears a book reading. She falls in love! Apparently this reluctant reader was no longer so reluctant.This book is great for Pre-K-2nd grade, reluctant readers.It will certainly appeal to kids that don't find books appealing, because they can relate to Beatrice and her dislike for the library. They can join in her realization and transformation as she finds out what a wonderful place it actually is.As a future librarian, this would be just perfect for little, reluctant readers. It is also a great way to get kids involved with recalling their first visit to library and how it was for them. At first, Beatrice is very stubborn about going to the library and reading. Her catch phrase is always "I don't want to". She changes her mind when her brother makes her listen to the librarian read to children. She realizes that there are books that she can enjoy, and now, she does not want to leave the library. This book shows children that there is a book for everyone. I found the illustrations delightful. *Beatrice is adamant about not going to the library or reading. After listening to the librarian read a book, Beatrice realizes that there are books that she can enjoy. I thought the illustrations were delightful in this book, and I think that many children will be able to relate to this book. Beatrice Doesn't Want To is such a cute book and so appropriate for this course. We are currently learning that making children aware to literacy enriched environments can help them develop literacy skills. Not only that, but it also helps them develop a better understanding for reading, helps them make real life connections and possibly helps them even develop a love for reading. With that concept in mind, I could not help but to log this book, because it resembles just that. At first Beatrice did not want to go to the library, but finally by the end of the story she developed an interest for it. I think this would be a great introductory book for getting children who may not want to read into reading. Read by: MelanieGenre: Comedy and HumorAuthor: Laura Numeroff Illustrator: Lynn MunsingerInterest Level: K-2Grade Level Equivalent: 1.2DRA: N/ALexile: 140 L This is a very cute book with wonderful illustrations about a little girl that has to accompany her brother to the library and she hates reading so she doesn't want to go. Her brother tries and tries to get her to read a book while at the library so she will let him write his report until he finally sees a sign for a read aloud with the librarian. The librarian is reading a book that Beatrice is able to make a connection to so she learns to love reading. This story is about a young dog (Beatrice) who has to go to the library with her older brother (Henry) who has to do homework. Beatrice repeatedly mentions how she doesn't want to read and finds excuses to get out of it until one day she was taken to one of the children's story time sessions at the library. The Librarian then reads a book that appeals to Beatrice. In the end, she loves reading and doesn't want to put books down. This would be a perfect book for young children who dislike reading. It teaches students that not all books are boring if they find some that appeal to their interests and hobbies. This story is about an expressive girl who doesn’t like books, reading, or the library. Of all places, Beatrice has to go to the library with her older brother Henry, who struggles to keep her busy while preparing a school report. In desperation, he leaves her in a library storytime session. Although stubbornly determined not to like it, she ends up liking the story so much that she wants to look through the book again after the session. This time her response of “I don’t want to” is because she doesn’t want to leave the library! It was an okay read but i can use this book to teach my children about the concept of mind-sets, attitudes and different perceptions. This book is about Beatrice going to the library. She doesn't want to go because she doesn't like books or reading. So Beatrice only wants to watch Henry work on his report and she becomes bored so Henry makes her go to the children's room to listen to a book. She enjoys the book and asks the librian if she can read it after. When Henry is ready to leave Beatrice doesn't want to. I love this book because it shows the power of reading. Once you read a book and feel connected to it, it becomes something special and you don't want to leave it. This book is cute, and primarily focused on the idea of sibling disagreement. Beatrice is the younger sibling that doesn't want to do what her brother, Henry, needs her to do. Essentially, she's an unending source of strife for Henry. As he attempts to do some research at the library, Beatrice complains about everything she is asked to do. Even when the story resolves itself and Beatrice learns to love the library, she is still her unwilling stubborn self. Good book for kids with a confrontational relationship with their siblings. Nicely done. Story about Beatrice - who doesn't like to read OR go to the library. But, her brother Harry has to take her there because he has to work on a report. Whenever there, she complains, whines, and follows him everywhere. Until Harry dumps her in storytime, tells her to sit put and its too bad that she doesn't want to. But when the librarian begins to read, she becomes drawn into the story. Roller - skates? Did the librarian say roller skates? Beatrice loves roller skating! By the time the story is done, Beatrice doesn't want to leave the library! Laura Joffe Numeroff - Laura Joffe Numeroff is the New York Times bestselling author of author of If You Give a Mouse a Cookie, Raising a Hero, and What Mommies/Daddies Do Best. She was born in Brooklyn, New York and graduated from Pratt Institute. Laura grew up as the youngest of three girls, surrounded by art, music, and books. An avid animal lover, Laura has always wanted to write a book about service dogs. She now lives in Los Angeles, California.